Dwyer hosted the camp in his hometown at his former high school in Marietta, GA. Proceeds from the camp will benefit the forthcoming Jonathan Dwyer Neuro Feedback Lab at Jacob’s Ladder Center. It’s great to do something fun like the camp while supporting the Neuro Lab that will undoubtedly change lives. Jonathan Dwyer, former star running back at Georgia Tech, hosted his second annual youth football camp in Marietta, GA, May 31st-June 1st. Jonathan worked to motivate and instruct 200 campers, ages 5-16 at his alma mater, Kell High School. His dual mission was to provide exceptional football instruction and raise awareness for ADD, ADHD and Autism in young children. Jonathan enlisted the help of his former coaches, teammates and the Kell High School football coaching staff to provide on-field instruction to campers. Additionally, Jonathan had the support of several members from the Atlanta Chapter of the NFL Former Player Association, who assisted in coaching including: President Tim Broady (Philadelphia Eagles), Walter Stith (Buffalo Bills), Chris Daft (Washington Redskins), Robert LaVette (Philadelphia Eagles) and Major Everett (Atlanta Falcons). The campers enjoyed two days of on-field activities, which included learning football fundamentals, various agility exercises and position specific drills. Campers also learned the proper techniques for tackling to avoid concussions. At the conclusion of the camp on Saturday, Jonathan led a mentoring segment entitled Chalk Talks. Jonathan used the time to speak about his journey to the NFL, the importance of excelling in academics and provide tips to assist campers in achieving their goals in life. The retired NFL players in attendance spoke to the campers as well, echoing Jonathan’s sentiments about education. Following the Chalk Talks, Jonathan presented hustle awards to campers who showed outstanding sportsmanship during the camp and gave all the campers gift bags. All proceeds from the camp will benefit the Jonathan Dwyer Neuro Feedback Lab, an innovative program at the Jacob’s Ladder Center. The facility specializes in educating children diagnosed with ADD/ADHD, Autism, PDD and Asperger’s among others. There are only five Neuro Feedback Labs in the country and they have proven to produce significant long term effects on young patients with ADD/ADHD and Autism. Jonathan was diagnosed with ADD in the 5th grade and has made it his mission to raise awareness about the condition in children. 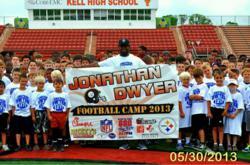 The 2013 Jonathan Dwyer Youth Football Camp was sponsored in part by the Pittsburgh Steelers, Chick-Fil-A, Dickey’s BBQ, 680 the Fan, NFLPA, NFL, Kroger, Kell’s Kitchen, United Medical Response, The Inhouse Productions, Bagelicious, Fontis Water, Orasi, Costco and Pro Sports.